Low or poor light is just part and parcel of wedding photography. As a professional it’s our job to find good light or provide it—and if we can’t solve any lighting problem in 2 to 5 minutes (We rarely got that 5 minutes!) then that’s just our BAD! My artistic philosophy has always been, by default, to use the natural or artificial ambient light in most wedding scenes as my base and ONLY add light when absolutely necessary. Too many wedding photographers add flash all the time giving the wedding a sameness of look and an unnatural quality that robs the wedding locations of their inherent character. Now wether this is because these wedding “flashers” are uneducated in the art of lighting or just plain lazy I can’t say, but for those of you who want to create more than just flashed record-shots of your bride and groom’s special day I offer, as a Professional Wedding Photographer for over 30 years, these insights…. 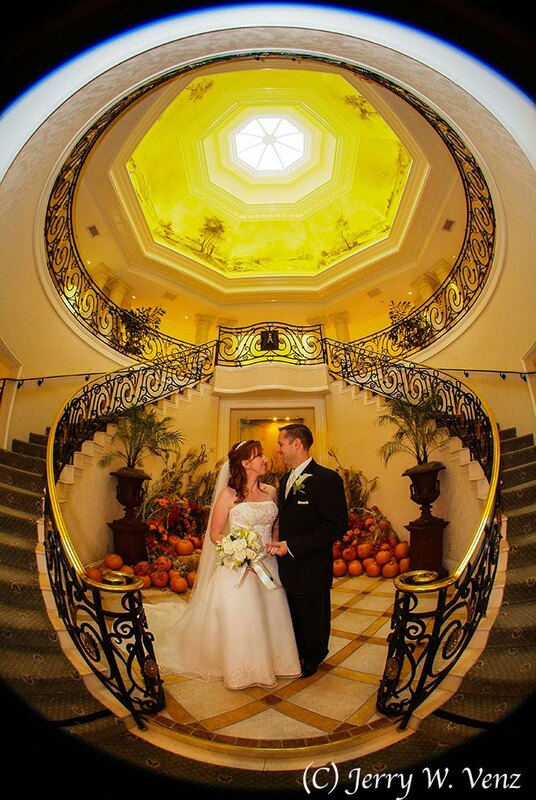 This 180°, vertical, fisheye image shows the skylight, my main overhead key light. In addition there are incandescent lights in the ceiling. However, because those lights are behind the bride and groom they were under exposed until I added a pop of flash from my on camera flash equipped with a Gary Fong Lightsphere to soften its light. This technique called “dragging the shutter”, where a long shutter speed (0.3 sec.) provides most of the light in the image while the short burst of flash adds just enough fill to give the couple nice skin tones and make the scene look natural. 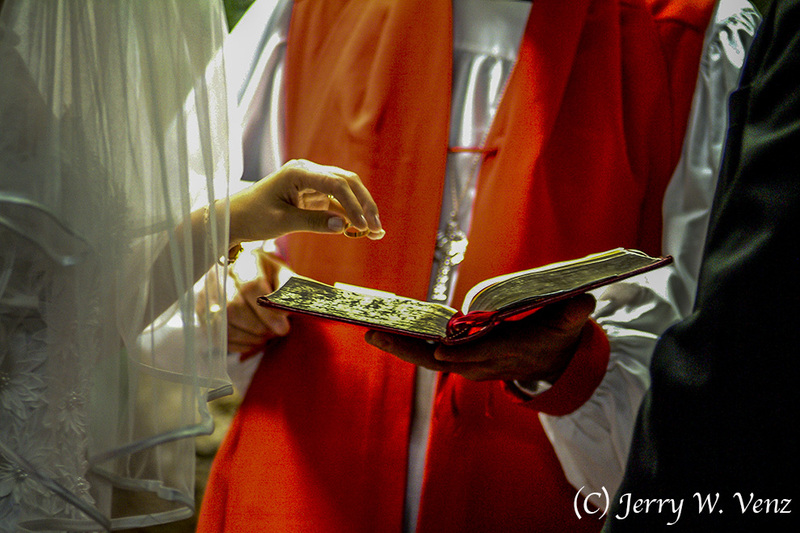 Next some low-light ceremony images…. This ring ceremony was done in a restaurant under a skylight giving me only top light. I was too far away for flash (I don’t use flash in wedding ceremonies generally) so I bumped my ISO up to 1600, opened up the lens to f2.8 and that gave me enough shutter speed (1/90 sec.) to stop the action. Again, no flash during the ceremony—that would have ruined the look of such a traditional ethnic ceremony. 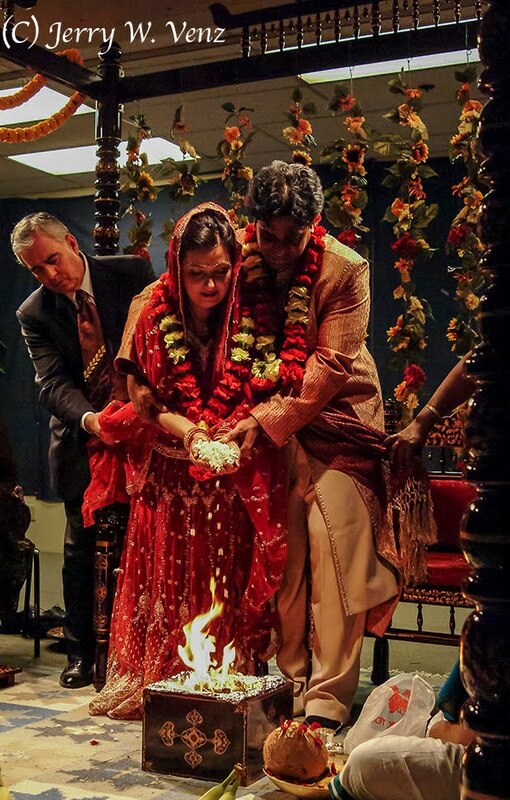 My goal here was to highlight the spiritual symbolism of the ceremonial fire as the bride and groom poured the rice into the fire. Using only the low ambient light, without fill flash, kept the background (the bride’s dress) a nice dark red that contrasted nicely behind the flames. This is basic available light ceremony photography. I’m locked down on a tripod at the back of the church popping a cross-star filter in and out, getting a variety of looks, using a filter box mounted on my 70-200mm f2.8 zoom lens. 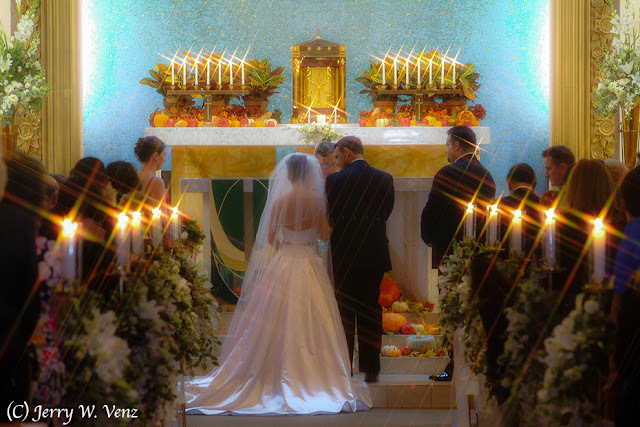 I always liked this church, especially when it’s a candle ceremony, because of the mixed color temperatures of the lighting. It gave me a nice contrast with the cool color on the back wall, caused by, of all things, florescent tubes, against the nice warm light of the candles. In Part 2 of Low Light Wedding Photography we’ll move on to reception coverage where there’s often the most challenging low light (to NO light at times!) situations of the wedding.